Review app features and pricing then once a plan is selected you will be taken to the manager. Upon signing up you are taken to the manager in the "Add App" area. 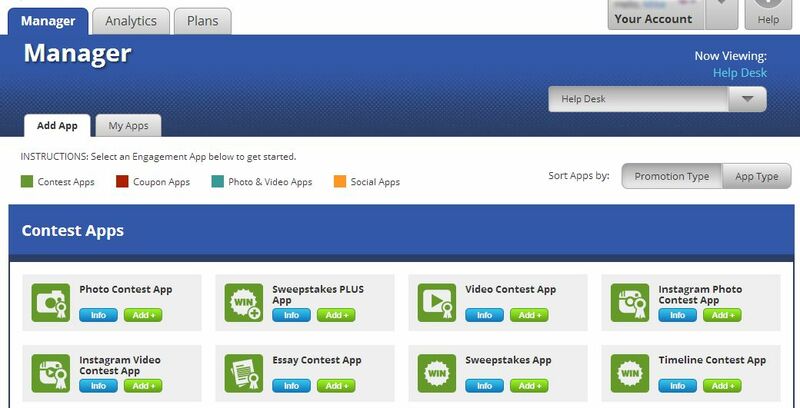 Review the different apps and select to "Add" a app. This opens up the setup for the App. Existing users will by default in the manager be shown the "My Apps" area where existing apps you have created are listed. Any app can be tested and setup. Play with any. You can deploy according to your TabSite plan level. The Info button on each app will explain more details after features about that app. Simply click the "Add" button to add a new app. Click the "My Apps" tab in order to view and access tabs that you have already created. This tab in the top left will give you access to the statistics on any app you have deployed. Next to Analytics is the "PLAN" tab where you can manage what domain you deploy to, what Facebook Page the tab is deployed on, as well as upgrade or downgrade the plan. General questions about Facebook Pages such as creating a Page on Facebook or whether to use a Personal profile or Business Account for your Page? See this help guide on Facebook Pages.